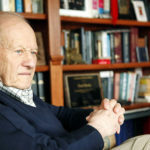 Paul Kurtz, a leading humanist who founded several secularist organizations, was mourned by nontheists across the spectrum following his 2012 death. Kurtz, who was 86 when he died on Oct. 20, 2012, helped establish the infrastructure of what has become a burgeoning freethought movement. His followers say that movement will thrive in his wake. Kurtz’s passing was announced by the Center for Inquiry, which he founded. Kurtz, a prolific author, also founded the Committee for Skeptical Inquiry, the Council for Secular Humanism and Prometheus Books. At the time of his death Kurtz was leading a new organization, the Institute for Science and Human Values. While secularists mourned his passing, they also pointed to the enormous growth in their movement in recent years. There are public personalities and best-selling authors who are making atheism and varieties of nonbelief part of the national conversation. But there is also an enormous growth in the ranks of the religiously unaffiliated, often called the “nones,” who profess no formal religious ties. A Pew Forum survey released in early October 2012 showed that in the previous five years, the unaffiliated increased from just over 15 percent to just under 20 percent of the U.S. adult population. But a story in The Washington Post, based on a poll released Oct. 22, 2012, by the Public Religion Research Institute, showed that religiously unaffiliated Americans are significantly less certain to vote than Americans who are religiously affiliated. ReligionLink has a source guide about the nontheist movement that provide background and expert sources for reporters writing about this topic. Read the obituary at the Center for Inquiry. Read the obituary posted by the American Humanist Association.